Christmas Candy Recipes Archives - THE OLIVE BLOGGER - Recipes your family will love! Ahh I can’t believe we are already on day 12 of our Christmas Baking Frenzy, where has the time gone?! Today we have a very special and VERY EASY treat, my Chocolate Caramels!!! They are the cutest thing you can make for your tray and the kiddos can even help with these ones, and the best part?? They are only 3 ingredients…yep they are a “cheat” goodie that will save you time and energy as you wind down your Christmas Baking and making. 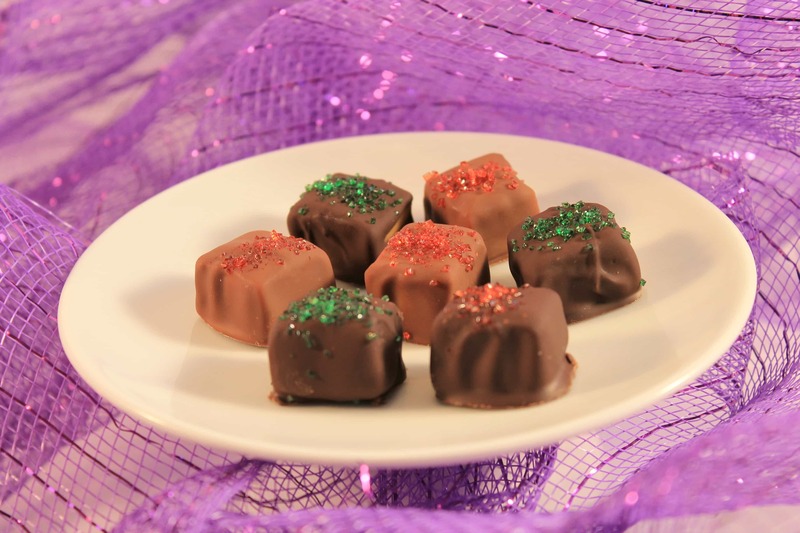 Chocolate Caramels – Only 3 ingredients for this tasty Holiday Caramel! The chewy caramel is covered in milky chocolate, a perfect flavor combination! Look at how the chocolate just envelopes the caramel, eee it makes me drool just looking at them!! We add red and green sugar to make them a little more festive but you could easily leave them as is or even drizzle white chocolate over them! Remember how I said they were sooo easy and only 3 ingredients? Bet ya thought I was lying or hiding something…but I didn’t! Follow along and see how incredibly simple these Chocolate Caramels are to make. These 3 ingredient Chocolate Caramels will be the easiest thing you make this Holiday season, and are the perfect treat for any goodie tray! 1 package of store bought caramels you will have to unwrap them, but it's part of the fun! Over a double broiler melt chocolate with the shortening, keeping the water to a low simmer beneath so you don't scorch the chocolate. Once melted remove from heat and dip caramels. Place coated caramels on a cookie sheet as you go, allow to cool for 5 minutes before adding your sugar so it doesn't melt into the chocolate. Place in the fridge to harden and then you can place them in little truffle cups before packaging or serving! One of the things I love about these caramels is that you can freeze them and pull them out when you need them! We make these a month before we put our trays together and have never had an issue with their quality…they are equally as delicious as the day they are made (yes you need to taste test when you make them…like everything you make from our 13 Days!)! So go ahead and get making, we only have one day left for this years frenzy…but don’t worry I have lots of goodies and tips coming your way between now and Christmas! !